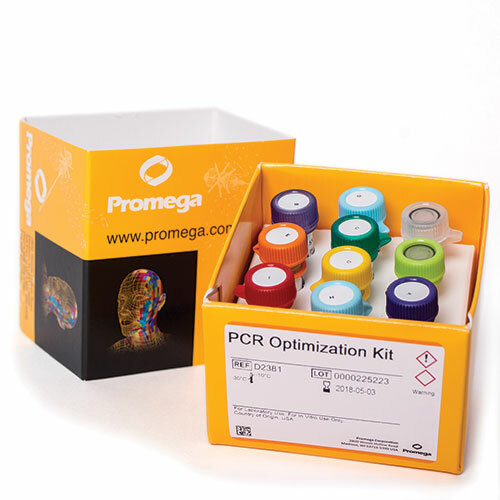 This new PCR Optimization Kit allows customers to rapidly define their own unique PCR master mix manufactured under cGMP for research or clinical use. The user’s defined optimal solution may then be ordered from Promega at any time with a unique part number as a custom cGMP master mix for shipment within ten business days. The PCR Optimization Kit includes magnesium chloride, GoTaq® MDx Hot Start Polymerase, and eight PCR buffers with an array of performance characteristics, all manufactured under cGMP. Assay developers will no longer be forced to settle for one-size-fits-all catalog master mixes. Early access users have identified their ideal PCR assays in as little as one month from receipt of the PCR Optimization Kit.